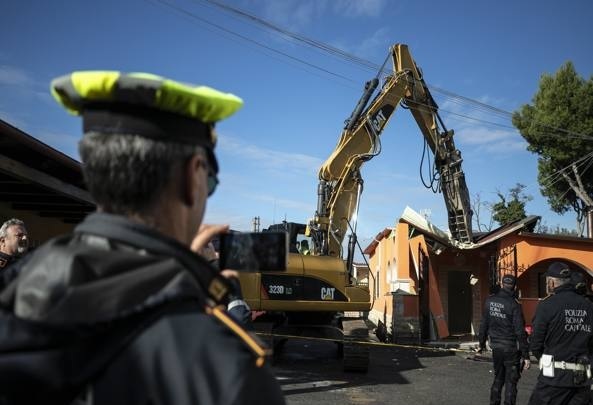 Police forces launched today in the outskirts of Rome the demolition of eight luxury homes built illegally by the mafia clan "Casamonica", well known for their acts of violence in Italy. "Today we started demolishing the first two villas," said the Mayor of Rome, Virginia Raggi, while the municipal police removed the latest furniture from the houses decorated with statues painted in gold, candlesticks and frescoes. The wave of operations will continue and we will demolish the eight villas. We will not stop until this territory is returned to the citizens of Rome," added the mayor. Illegal constructed villas are located in the neighborhood "Quadraro", East of Italian capital. More than 600 police officers were mobilized for this operation, which preceded the day before with the removal of thirty residents of these villas. "Today is a beautiful day for the Romans. We will restore legitimacy, rules, discipline and security," said Matteo Salvini, Interior Minister and Head of the League (right-wing extremist). The League governs Italy thanks to a coalition with the 5-star Movement (populist), part of which is also the mayor of Rome.